Find here the best Butternut Box coupons and vouchers. Butternut Box is the modern way to feed your dog. Simply put it, we put the food back into dog food. We are the Uk’s first fresh cooked dog food company. All our meals are home-cooked meals using fresh ingredients, cooked in small batches. All meals are perfectly portioned to your pup, and delivered hassle free to your door. We believe all dogs deserve to eat the healthiest, natural food made from the freshest ingredients with none of the nasties. That’s why we only use ‘real’ ingredients and are an answer to the highly processed and unbalanced traditional dog food. Each dog’s box is specifically tailored to them based on their individual requirements. We take all the hassle away by pre-portioning meals into daily servings – just open, serve and set their tails to “wag”. Our nutritional consultation takes into account the age, weight, breed, body condition and activity level of your dog to help us create a truly tailor-made meal plan. We’ve created food that’s perfect for dogs of all life stages, health concerns and allergies with all our meals being free from most known allergens and low fat chicken and turkey options available. Our subscription is completely flexible to each pet parent: They can customise their meal plan, pause or skip a box at anytime. 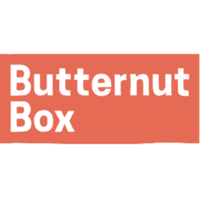 We offer an introductory 50% off a customers first box, plus a free ‘Butternut bandana’ to say thanks to our new pet parents.